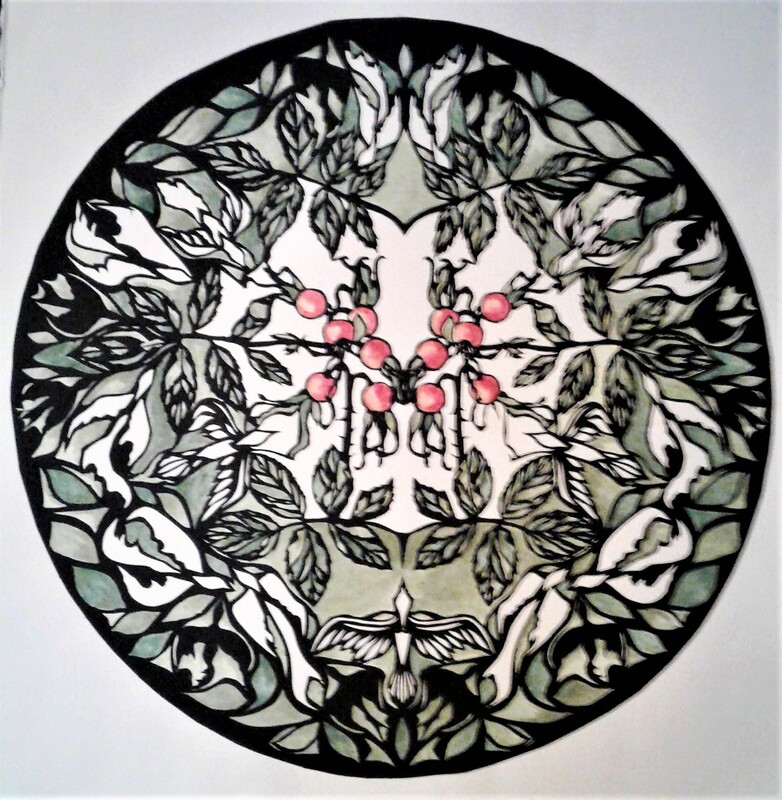 Susan Sidwell | Bug Ball | papercut print | 30" X 22"
Susan Sidwell | Rosehip Mandala | painted papercut print | 30" X 22"
Art has always influenced my thoughts and dreams. My family, farming, and flowers compose the last 30 years. Many of the images in my art are related to the inspirations I find in nature: i.e. flora, fauna, bugs, butterflies, birds, and animals. I dabbled in printmaking in my college years and became fascinated with my relationship to negative space. Papercutting has enabled me to explore layout and design. Cutting and printing my paper cuts continues to excite me. My upstairs studio at my farm houses my enormously heavy, full-size, hand-crank press, which allows me to lift a very sharp print off a piece of cut cardstock paper. Interestingly enough the cut paper plate can survive hundred of prints using oil based ink. I am predominantly printing on fine cotton papers and cotton fabrics. I seem to live for black and white in my art. In some papercut prints I go back in and hand paint the images. 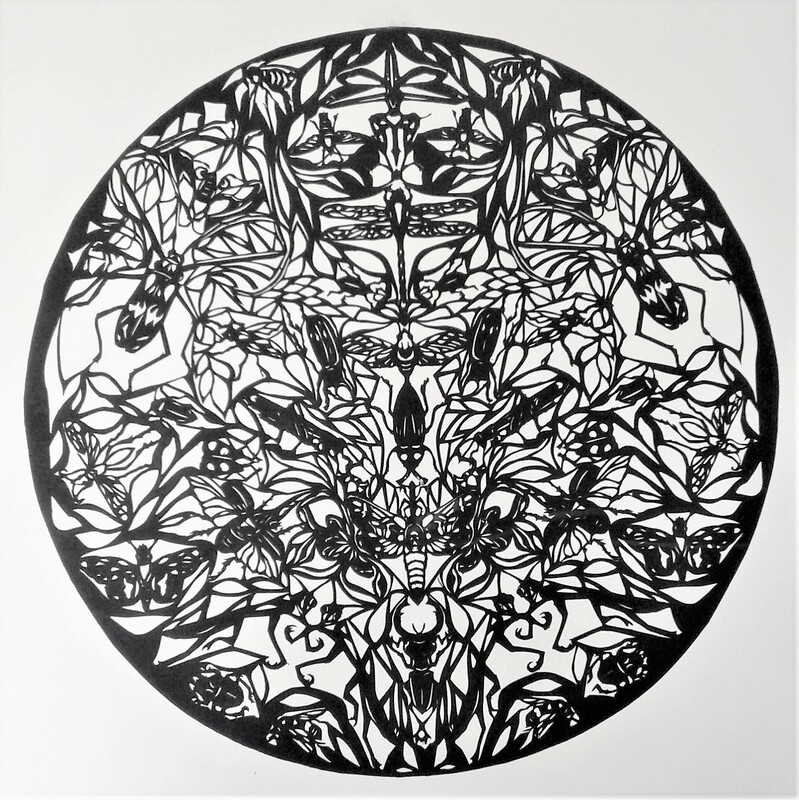 My papercut prints seem to dominate the art I am doing presently in that they are very economical to produce and make a reasonably priced original hand-cut print. Other areas I am exploring in printmaking are collages and collagraphs.